This glorious hand-tied bouquet is not only feminine but stylish as well. 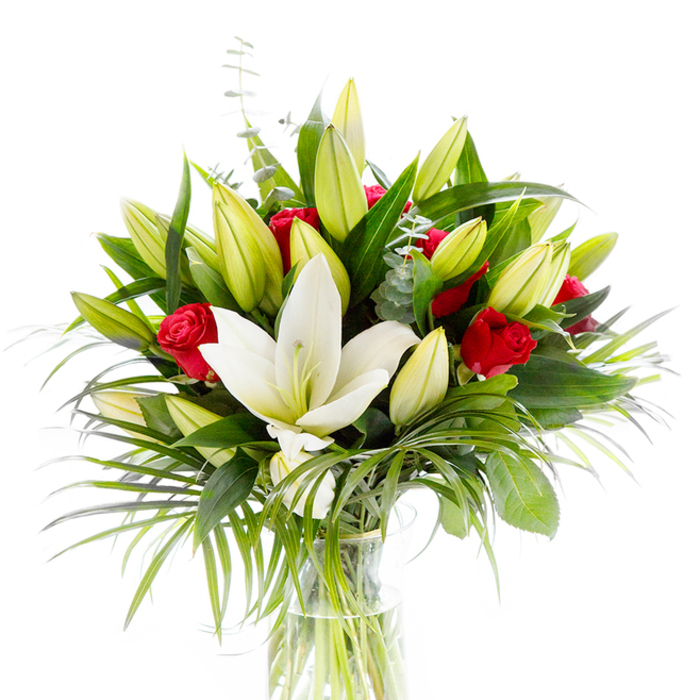 This is achieved by the selection of White Oriental Lilies, complemented with velvet red roses, salal and palm leaves. Original Bouquet contains 9 stems. Original and Grand sizes available upon request. Size pictured is Original. Immaculate bouquet and really brilliant service. I'm impressed with the service. The flowers were delivered on time. All of them were of very high quality, very fresh and fragrant. Will recommend you to all my family and friends! This bouquet just made my birthday! Roses and lilies were combined in an exquisite way. Thanks for the timely delivery. The lilies looked very beautiful. Totally worth spending my money on them. Ordered the bouquet for a delivery in Birmingham. It was delivered as requested and the recipient called me right away to tell me how gorgeous the flowers were. Great service! Lovely flowers! I adore lilies and find this combination with red roses pretty amazing! Very creative designs, freshly picked flowers and quick delivery times – this online flower shop was everything I had hoped for! Can’t express how grateful I am for the sensational flowers you delivered for my anniversary! Thank you so much! Ordered a bouquet online, it got delivered just in time for our anniversary. Made my wife really happy, thanks! 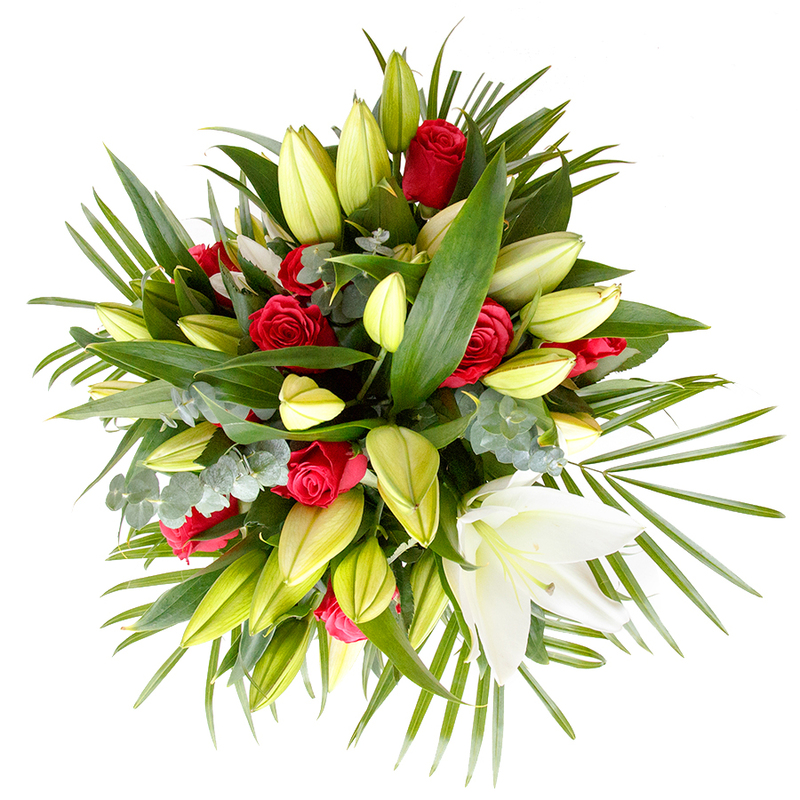 Impressive delivery of this bouquet and the flowers are just divine – wonderful website that I’ll use again. Got a call from my intended recipient to say the flowers were ‘lovely’! Ordered my flowers in much advance for my parent’s anniversary so they arrived on-time. Was also really pleased to hear that some of the flowers came in blossom so they lasted longer. The bouquet is gorgeous. I had them delivered to my home address as I wanted to take them to my friend personally and was really impressed with how nicely they arrived and just how stunning they were. If you want a first class service, then this is the company! Absolutely perfect service from start to finish and best range of flowers I’ve found. Needed some get well soon flowers for my mum in hospital. Ordered one day and they arrived the next and she called to say they were beautiful, that not only cheered her up but everyone else on the area too!